The latest estimated cost of holding the Scottish independence referendum stands at £13.3m, a rise of about £3m on previous figures. An impact assessment report to the Scottish Parliament said running the referendum itself would account for £8.6m of the total sum. Another £4.7m will be spent on regulation and campaign mailshots. 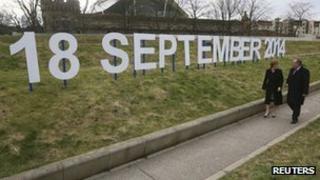 Scotland's voters go to the polls on 18 September next year when they will be asked to say yes or no to independence. The last time the costs of the referendum were looked at was in the Scottish government's consultation paper Your Scotland - Your Referendum, published at the beginning of last year. On page eight of the report it said the total cost of the referendum "is likely to be around £10m, the bulk of which will be spent on running the poll and the count". It added that those figures were broadly in line with the costs, per voter, of the Welsh Assembly and AV referendums in 2011. The business and regulatory impact assessment report, signed off by Deputy First Minister Nicola Sturgeon and lodged at Holyrood on 21 March, said the costs associated with the referendum could be separated into four broad categories. The costs of allowing each of the main campaign organisations - Yes Scotland and Better Together - a free mailshot to every elector or household in Scotland. On implementation and delivery of the vote, the report said: "The Referendum Bill sets out the detailed rules relating to the arrangements for voting and the conduct of the poll and the count, which are all in line with the procedures for local government or Scottish Parliament elections. "This will help ensure that there is confidence in the legitimacy of the process and of the result. "The Scottish government has consulted extensively with electoral professionals to ensure this consistency and that the proposals are workable."